Now isn’t this the cutest robot you’ve ever laid your eyes upon? 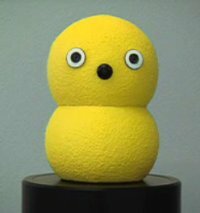 The Keepon doesn’t transform nor does it even come with a pair of arms – instead, it looks more like a yellow snoman with large eyes and the ability to bob according to the music being played in the background. Built by Hideki Kozima, the Keepon robot was also designed to interact with children by communicating attention and emotion courtesy of a couple of cameras and a microphone. Unfortunately, Keepon is not up for sale. It probably would have launched a frenzied rush should it be released this holiday season. I know I would line up for one! Keepon is sooooooo cute! I found more more of him at http://www.cmu.edu/robou.